I LOVE the sun. I really, really do. Summer is my favorite time of the year, because I love the beach too! I have no problem getting a beautiful tan during summer. In fact, I would not want to go home from the beach without a tan. I want that stamp of summer every single time I get the chance. But then, being tanned is not all that. Sure, it can look glowing and gorgeous during the first week, but the following weeks, or months, if you don't exfoliate regularly, you will slowly see your skin ( your arms, legs ) looking patchy, dull, and uneven. The darkness wouldn't be flattering as it would look dirty and dull. Sometimes, I just shrug it off, but how can I shrug it off with Belo's new wonder soap? The new Belo Intensive Whitening Bar is my best bet post-summer with the powerful ingredients Kojic Acid and Tranexamic Acid. 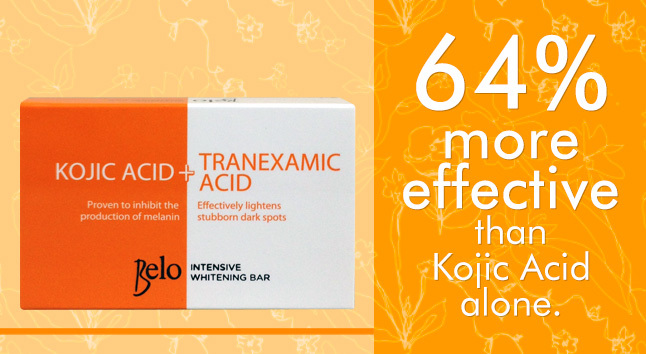 I've used Kojic Acid already before, and yes, it really does whiten the skin, but with an additional ingredient called Tranexamic Acid, that boosts the effectiveness of Kojic Acid 64% more than when with Kojic Acid alone! I was quite excited because I wanted my skin to go back to its even state - yes, I am game to become whiter in the next few months, and will commit myself to using this! Using the new Belo Intensive White Bar, I would have to ask you to check if you are sensitive to this product - Kojic Acid actually causes some skin to sting for a bit, so check your sensitivity to it. It's normal. A slight sting would be acceptable. The most effective way I was taught of to make a Kojic Acid soap work was to lather this on the entire body, and let it dry for a minute on your skin before you rinse. Absorption was the key. There are times when I actually do this, but there are times that I am actually too busy so I just lather it in my entire body, and shower off. As for the sting, I do not experience any of it, so I count myself lucky! I am happy to say that after a week, I have seen my skin lighten up one shade, and it became brighter and more even. I am somehow addicted to the Belo Intensive White Bar as I would want to repurchase and just use this everyday to pave the way into fairer, even, and beautiful skin! Call me hooked, but who doesn't want beautiful skin? I'm in love! This bar can also be used on the face for dark spots, but please do not forget to apply sunblock on your body, and on your face when you are using this! So, who's tried this, and who's with me in saying I love Belo Intensive Whitening Soap?